The makers of tough commercial and military boats know how to do comfort, too. is a fine illustration of innovative and unconventional thinking. But their latest creation, the Tauranga 38, is such a unique craft that even the most avant-garde boaters among us will do a double-take when they see one at the dock. 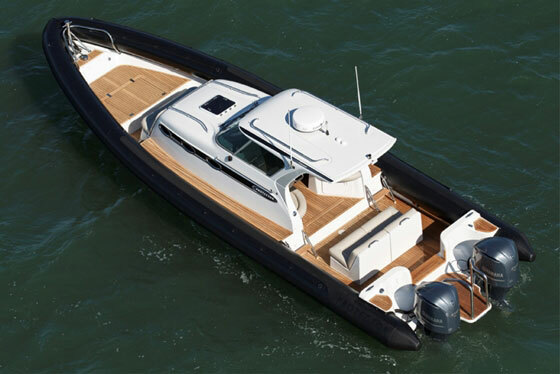 With teak decks and a high level of comfort built in, the Protector Tauranga 38 has a different set of priorities than those of its utilitarian siblings. RIBs have changed and developed as quickly as any other types of modern powerboats, but the Tauranga definitely skipped a few rungs on the evolutionary ladder. It’s as far from the RIB workboat heritage as it could possibly get, with a full cabin, sportboat performance, and luxury appointments. Topsides, a beautiful teak deck greets your eyes and the soles of your feet. You can choose from black, blue, white, yellow, gray, or red UV/petroleum-resistant Hypalon tubes, and this may well be the only RIB in the marina with a swim platform and stainless-steel swim ladder. 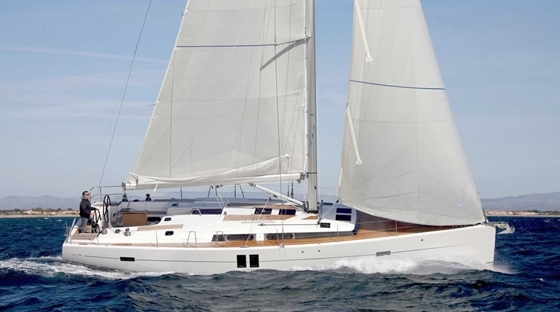 It also may be the only boat of its breed that can be outfitted with a Side-Power electric bow thruster, and a windlass and anchoring system. Your passengers will surely think so, whether they’re in the aft raised Crown custom seats, or sitting on the standard bench. Ditto for those riding on the forward bow seat, which converts into an optional tanning pad. Want everyone to be comfy, even when the climate isn’t cooperating? 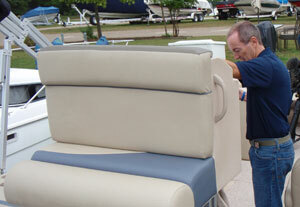 No problem; Protector also offers a 7,000-Btu heating system and a 3,500-Btu air-conditioning system on this boat. Now let’s say that in between long cruises and good-samaritan rescues you want to catch a finned critter or two. Though fishing certainly isn’t the stated goal of this boat, Protector made some notable adjustments to accommodate anglers aboard. 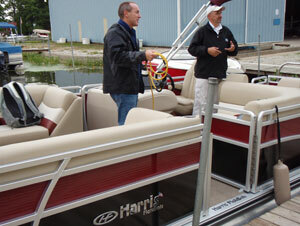 Optional rod holders can be mounted on the transom, rocket launchers can grace the hard top, and there’s even an option for a draining stainless-steel bait board with rodholders attached. The Tauranga is available in several power configurations including twin or triple outboards (up to 1,050-hp total) or twin diesels, but the twin 350-hp outboard version is sure to be a popular choice. Performance is more than sufficient—extreme, compared to most RIBs—with a cruise of about 33 mph and a top end hitting 50. Triple 350s will net you a top end of over 60 mph. Efficiency is also pretty good with the twin-engine rig, allowing for a hair over a mile to the gallon and a 300-mile range. More importantly, with the 18-degree deadrise hull, a Hypalon collar, and shock-absorbing seats softening the blows, you can crank the speed up in seas that would have most boats jarring your fillings loose. 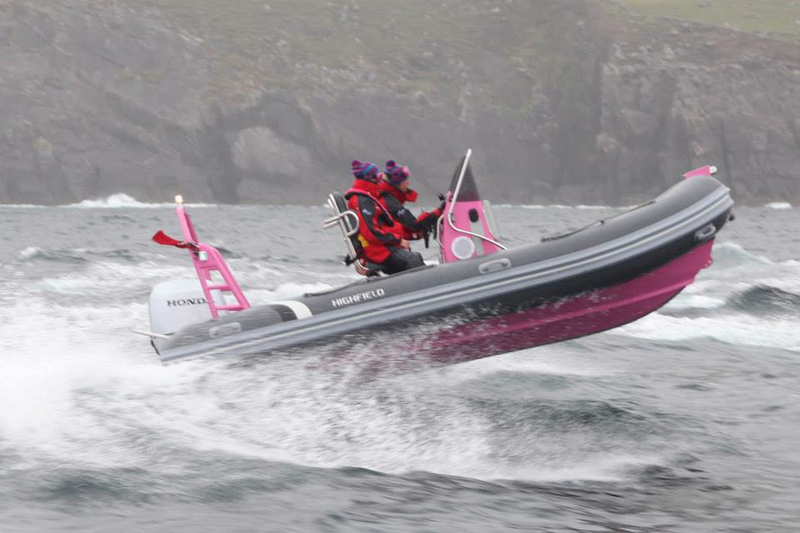 In fact, the seakeeping ability of a RIB is one of the characteristics that sets it apart from regular boats. Sure, that collar causes you to lose usable beam (nearly two feet of the boat’s width is dedicated to the tubes), but having all of that flotation ringing the boat enhances stability greatly, gives added buoyancy to reduce the possibility of stuffing the bow, and boosts load-bearing capabilities. Considering the performance and seaworthiness the Tauranga enjoys, it’s no wonder that Protector also offers this boat in a commercial/military version. Of course, the options change a bit. Instead of extra seats and amenities, the commercial versions can get rigged with goodies like a remote-operated fire pump, a FLIR night-vision system, a cabin emergency medical system, and my personal favorite, a shotgun/M4/AR-15 mounting system. Of course, most of us won’t use this RIB to defend our crib. 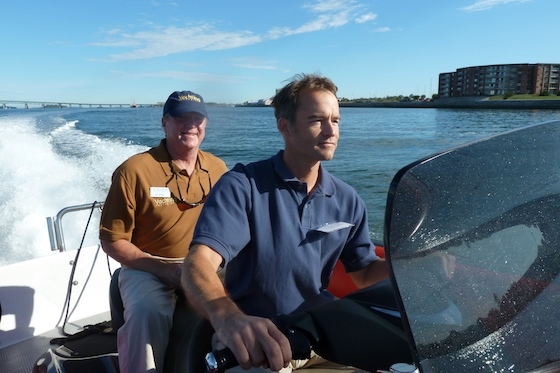 But it’s nice to know that Protector builds them strong enough to satisfy organizations ranging from New Zealand’s Coast Guard, to the Maine Marine Patrol, to the Jamestown, Rhode Island Fire Department. 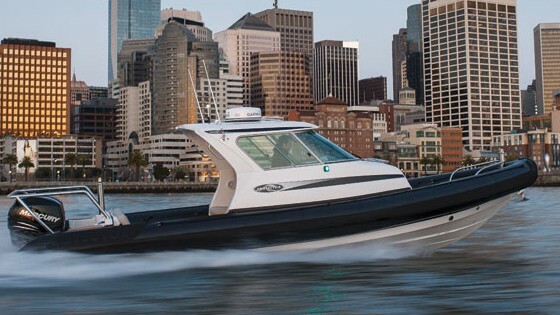 The rigid part of the hull is solid hand-laid fiberglass, all fittings are stainless steel (even the pressure-tested fuel tank is constructed of stainless), and the collar is built with five separate chambers. 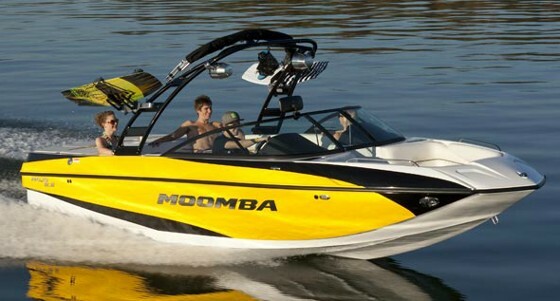 Rugged individualist types who find this boat attractive might also want to equip it with some cross-over goodies, which are available on both commercial and recreational models. Put that Sampson post and winch on the bow. Add the stainless motor-protection rails to the transom and the keel guard to the hull bottom. Put on a towing bit. All seem perfectly harmonious on the Tauranga, and they’ll give you the ability to turn mere cruises into real adventures—or form your own standing navy. Either way, one thing’s for sure: this boat is anything but same-old, same-old. Also see the Rayglass (Protector’s manufacturer). RIBs like this are few and far between, but there are a few other boats to consider in this niche: HBI Custom Boats has produced a 30’ customized center-console RIB, and 35’ and 47’ cabin RIBs. Pirelli Pzero also offers some unique RIBs in this size range.